On Monday January 14 the Mayor of Gdansk (Danzig), Pawel Adamowicz, 53, died following three stabs at his heart and abdomen the previous evening. He was attacked during the biggest annual fund-raising event in Poland, the joyous and conciliatory finale of an annual concert by the Great Orchestra of Christmas Charity — a charitable foundation, whose work was hated by the far right. Mayor Adamowicz had long been the target of a hate campaign by the extreme right and by TV channels controlled by the ruling party, Law and Justice. “He became the victim of a wave of aggression,” said distinguished sociologist, Jadwiga Staniszkis. Deputy Speaker of the Senate Bogdan Borusewicz, person recognized as a moral authority, called the tragedy “political murder”. Pawel Adamowicz had served as the Mayor of Gdansk for twenty years. Under Communism he was a dissident, though at that time at the conservative end of the anticommunist opposition, and after the 1989 democratic transformation served as Vice President of Gdansk University. He became a very popular mayor, having a decisive impact on shaping the city as a progressive center of culture. It was under his leadership that extraordinary structure European Solidarity Center, the Gdansk Shakespeare Theater, and the Museum of the Second World War were built. He was the Mayor who invited refugees to Gdansk in the context of the current Polish government’s total ban on refugees. For his hospitality, an ultranationalist militia, All-Polish Youth, drew up a mock death sentence for mayor Adamowicz. Recently the president of the Orchestra was accused in a New Year cabaret on official television of absconding with Charity funds; the money was presented as dollar bills featuring the Star of David. Public protest followed this act of anti-Semitism. In my opinion, it was an assassination fueled by extreme bigotry against both the Charity and the Mayor. It constituted a major blow to democracy in Poland and in Europe. “Hatred has stabbed freedom in the heart,” is how it was summarized in an editorial by Adam Michnik, legendary dissident, political thinker, and editor-in-chief of the region’s largest daily Gazeta Wyborcza. This past week huge crowds of mourners, demonstrating against violence, gathered in Gdansk, and vigils were held throughout Poland on Monday and Tuesday. On Wednesday Poland’s Chief Rabbi Michael Schudrich prayed for Pawel Adamowicz in Warsaw’s Nożyk Synagogue, and an imam had visited the hospital while the Mayor was being treated there. 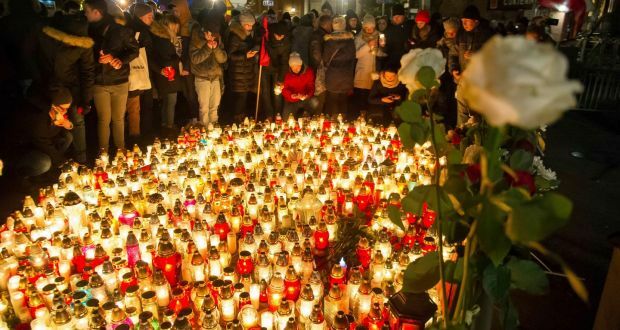 The body of Pawel Adamowicz lies in state in a casket draped in the flag of Gdansk/Danzig, without religious symbols, in the European Center for Solidarity; over fifty thousand people have come to pay their respects. A rainbow flag appeared in the cortège accompanying the coffin through the streets of Gdansk/Danzig on January 18. The following day, after cremation, the ashes of the Mayor will be laid to rest in St. Mary’s Basilica, close to the site of the assassination. Many major cities in the world have held vigils for Mayor Adamowicz and against hatred. On Monday the 14th, in front of the Polish Consulate in New York, speakers at a small gathering, acknowledging the very short notice and sudden cold, spoke of the far bigger demonstrations unfolding elsewhere, but also the dangerous spread of hatred and hate speech in so many countries of the world today.